The ultimate tough watch by Casio, refined. 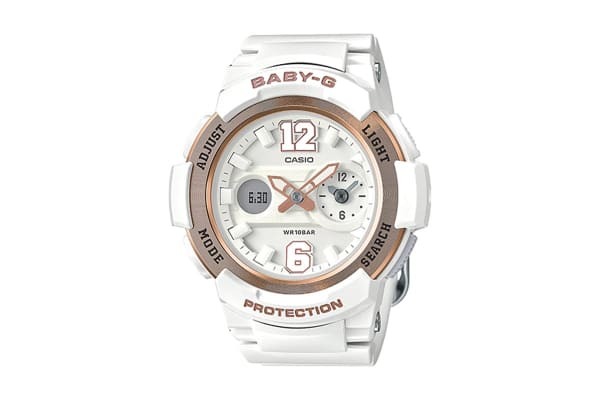 The Casio Baby-G Digital Watch is water and shock resistant, and designed for a variety of sport fashion fits. 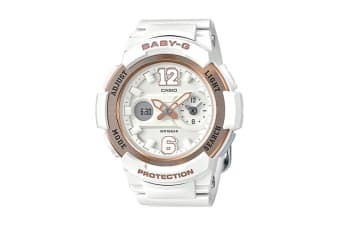 The Casio Baby-G Ana-Digital Watch features big Arabian numbers at 12 and 6 o’clock of the sporty BGA-210 Series is designed to resemble the jersey numbers on sports uniforms. Dual Dial World Time shows the current time in two cities simultaneously. The main hand and the dial at 3 o’clock show both your Home Time and a time in another zone. The two times can be swapped with each other by simply holding down the button at 4 o’clock. A wide face and elegantly color aluminum bezel combine to create a multi-dimensional case. The cool design of this watch goes well with a variety of different adult sports fashions.